Making First Impressions Count With A Bury St Edmunds Orangery. The builder/property developer owner of this single story lakeside contemporary house has worked with the Cambridge Conservatory Centre for many years. But when he wanted an Orangery for his own home, came with a very specific brief. He wanted to create a side entrance that would make the most of the light while making a big impact. Their home bordered a lake giving the living spaces a fabulous outlook but the facade on the driveway approach side was lacking in comparison. Something he wanted to change. And change it he did. There is certainly nothing lacking about this Bury St Edmunds Orangery! 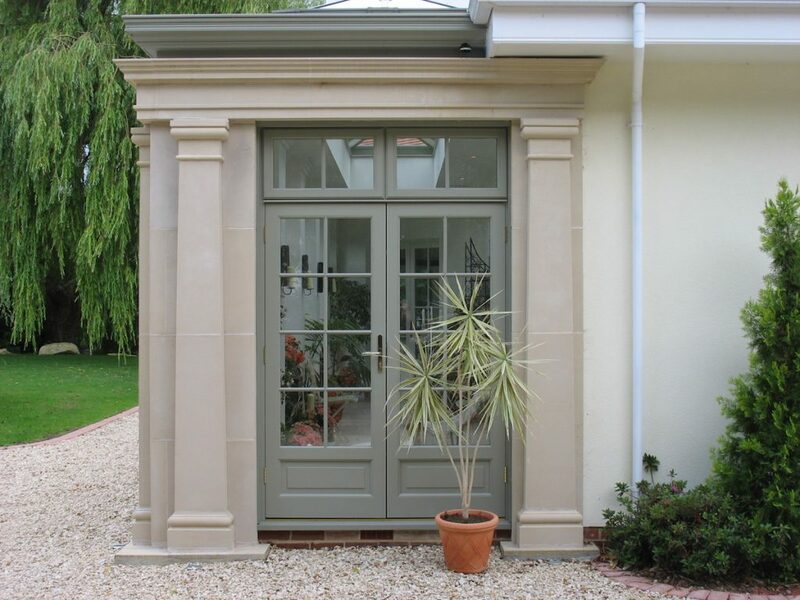 Replicating the look of an orangery that harks back to times past, this side entrance hall certainly makes an great first impression. 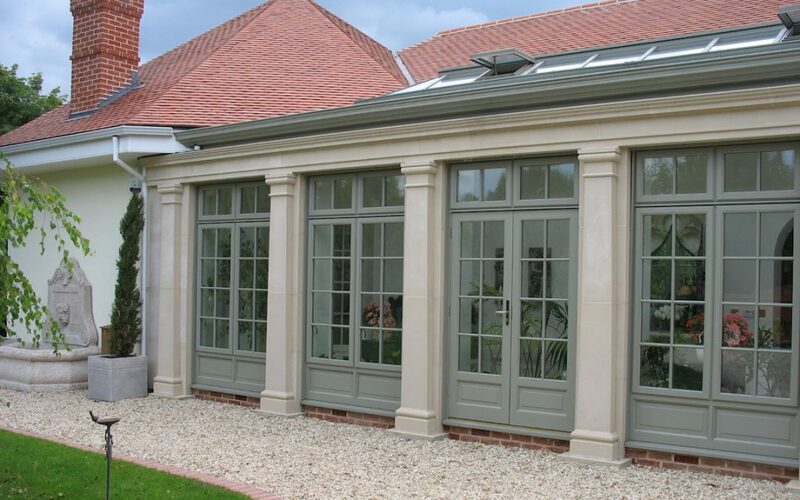 With traditional column detailing, a beautifully crafted lintel and gorgeous full height windows, this Bury St Edmunds Orangery is everything the owners could have wished for. At almost 10m long by 2.4m wide, not only does it give him a stunning side entrance to his lakeside home with direct access to the kitchen and drawing room, but it also doubles as a light-filled space to relax in. 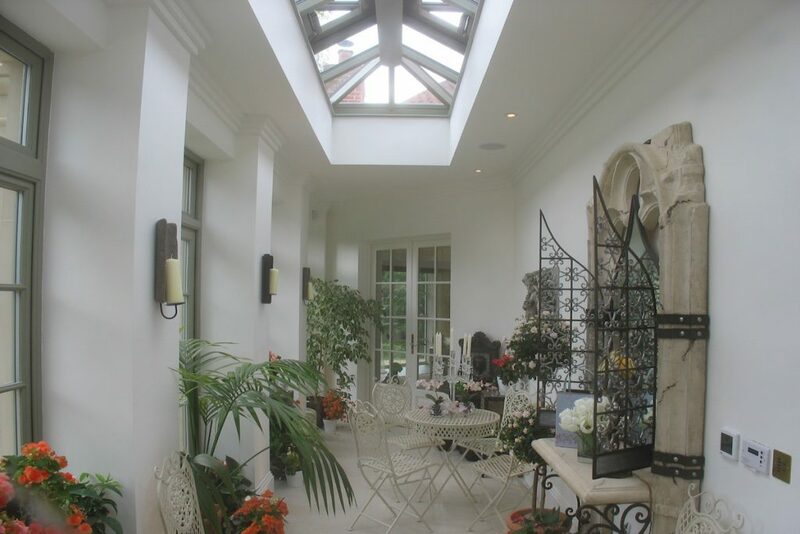 Furnished in cream delicate patterned wrought iron furniture and filled with tropical plants in pots, this orangery continues the traditional detailing from the outside into the interior. Pillars form deep reveals to house pots and curios. Candle sconces on each pillar gives the feeling of having stepped back in time. But there is no sacrifice of modern living here. A thermostat controls the underfloor heating and the lighting is managed from a panel mounted discreetly on the wall. Fully insulated and fitted with thermally efficient glass, this entrance hall is the perfect mix of eclectic style and 21st century convenience. The approach to this home is anything but boring and hints at the wonders that lie just beyond the side door. 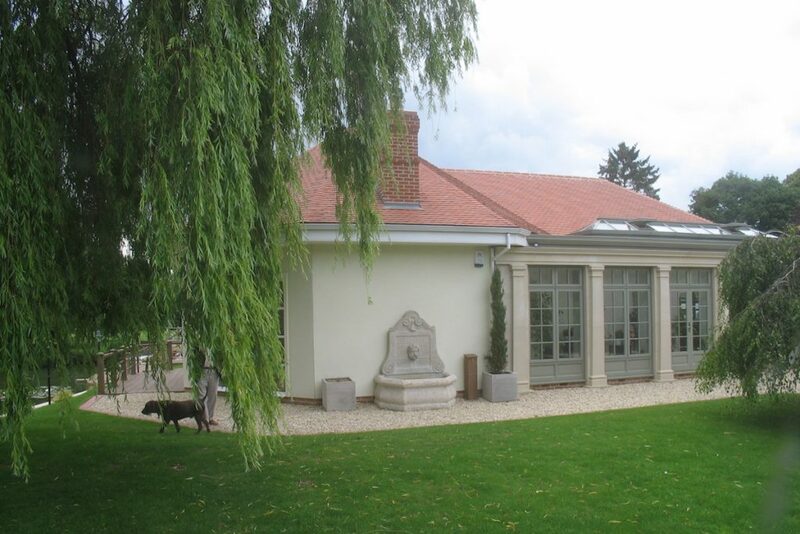 A truly successful Bury St Edmunds Orangery that delights the owners and visitors alike.